What is it about a state fair in Oklahoma that draws millions every year? 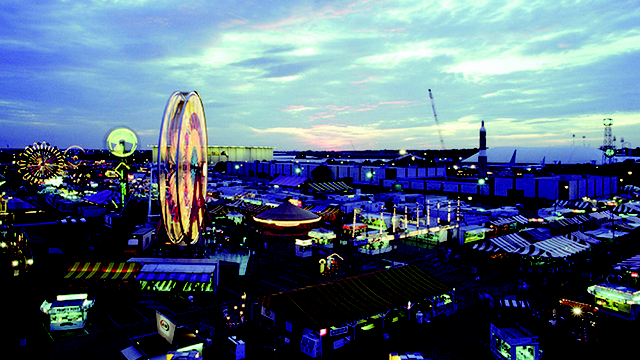 More than two million people pass through the turnstiles at the Oklahoma State Fair in Oklahoma City and the Tulsa State Fair annually. That’s more than half of the state population! Not only do they attend, Oklahomans support the fair financially. In 2004, Oklahoma City residents voted to pump $66 million into their state fair park. Ten years later, the economic impact is substantial and the level of entertainment now available is world renowned. Organizers like to say, if you haven’t been to the Oklahoma State Fair lately, you haven’t been to the fair, so we decided to check it out. Gallery crews spent four days in September at The Oklahoma State Fair in Oklahoma City shooting morning to night capturing as much of the action as possible. For the price of admission, fair-goers have access to world-class entertainment scattered around the grounds. What a treat to see the Zoppe Italian Family Circus presented by an Italian family that has been in the circus business for 7 generations, or the largest Birds of Prey Raptor Show in the nation and then there is The Centennial Frontier Experience which includes acts that have performed for kings and on national television. You just walk up with your corn dog or funnel cake, have a seat and enjoy! The challenge in doing a program on an epic subject like a state fair is that you want to include as much as possible to show scope, but you also want to take time to let viewers experience each element. While we couldn’t include everything, Gallery hopes our viewers get the flavor of the Oklahoma State Fair when they tune in for “A Fair Assessment” in November.